School records indicate that Antonio has poor work and study habits and is not finishing his assignments on time. His assignments are rarely completed. However, the work that is completed is almost always accurate. He is frequently off task, out of seat, and disruptive. He has difficulty concentrating during independent seat work for more than a few minutes at a time and has to be consistently monitored. Antonio’s struggles with basic writing skills and is frequently frustrated. He is unable to write with the speed and fluency of his fellow classmates. His writing is very immature and stick like. Antonio demonstrations inadequate letter formation and size. He struggles with spatial ordering. 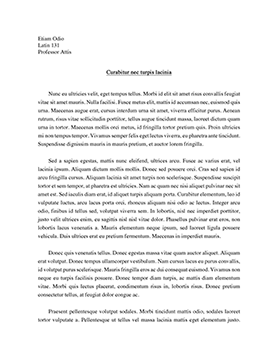 Because of his poor use of lines on the paper and uneven letter spacing, Antonio usually uses several sheets of paper to write an assignment that typical peers his age are able to write on one page. Student Strengths: Enjoys Social Studies, creating oral presentations, and working with the peer group. I believe this student would benefit from Differentiated Instruction. ... with graphic organizers and “cue cards” as a visual tool to organize and support Antonio’s thoughts throughout the writing process. The “cue cards” will list the steps of the writing process he needs to follow and a checklist that outlines the sequence of steps Antonio needs to follow to complete an assignment. As Antonio completes an assignment, he can “check” it off his list. These strategies will be used throughout the course of the day in all academic areas that require the student to write to ensure academic growth and progress. The educator will monitor the success of this intervention by using a frequency chart to record on task behavior and importing and charting the data in an excel file. If the intervention is successful, Antonio’s on task behavior and ability to complete assignments should increase.